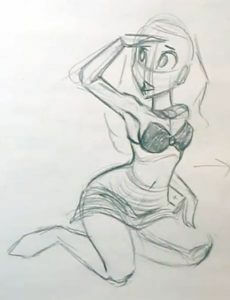 Now that you’ve created the basic pose in the previous lesson on cartoon drawing techniques, it’s now time to go back into the drawing to clean up your lines and learn how to polish the pose. But what does ‘Tighten Up Your Drawing’ mean? If you’ve never heard this expression before, don’t worry because the concept is easy to understand.If you look at the image to the right you’ll see that the lines are quite sketchy and they aren’t very well defined. There is a bit of looseness to these lines, which is great when you are sketching out your character in the beginning. As the drawing goes from sketch to more of a finalized look you will want to ‘tighten’ up those loose lines by erasing the unwanted lines and using harder, more deliberate strokes to leave nice clean lines like in the next image. This is what polishing the pose means in cartoon drawing techniques. In this example image you can see how the loose lines have been mostly removed so that it’s quick and easy to trace over them with more refined pencil strokes. Continue to erase and refine the lines over the whole drawing. This will take you from loose to tight lines and give you the finished look that you’ll be going for with all of your drawings. In addition to tightening up the line work and polishing the pose, you can also add in some bits of shadow to give more depth to the drawing. That’s it for this lesson series on cartoon drawing techniques and posing your character. We hope that you learned a lot and that you’re now able to start adding more life to your drawings with more dynamic poses!